As you know, a high pass filter is one that is designed to pass all frequencies above its cutoff frequency. 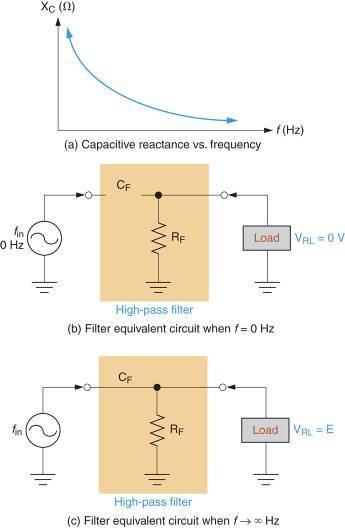 High pass filters are formed by reversing the positions of the resistive and reactive components in the RC and RL low pass filters. 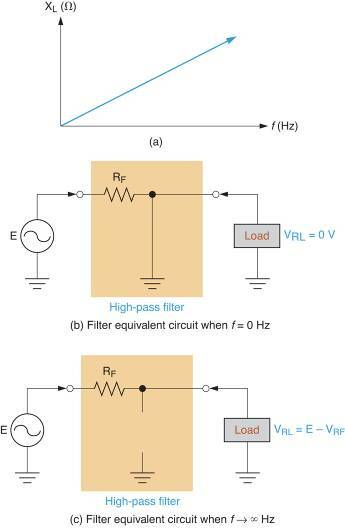 In this section, we will discuss the operation of RC and RL high pass filters. 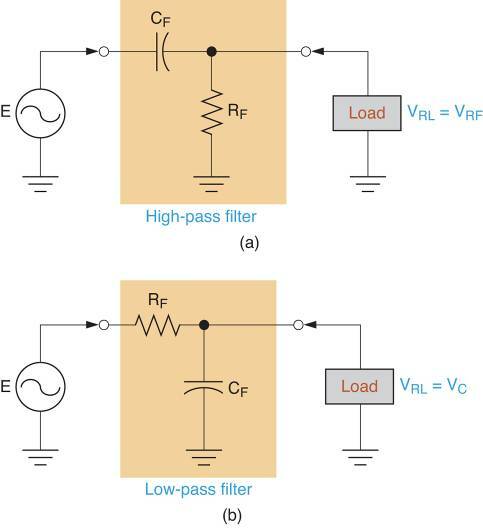 As you will see most of the relationships for high pass filters are nearly identical to those for low pass filters because the primary difference between a high pass filter and its low pass counterpart is component placement. An RC circuit acts as a high pass filter when constructed as shown in Figure 1a. 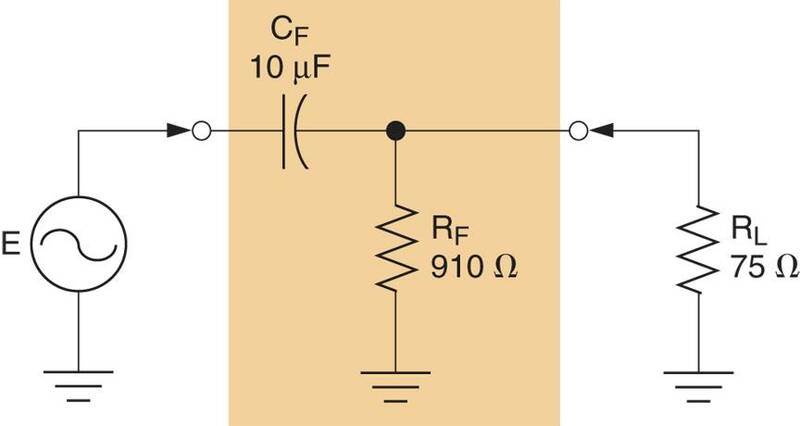 For comparison, an RC low pass filter is shown in Figure 1b. As you can see, the capacitor and resistor positions are reversed between the two circuits. In the high pass circuit, the capacitor is in the signal path and the resistor is the shunt component. The filtering action of the circuit in Figure 1a is a result of the capacitors response to an increase in frequency. This response is illustrated in Figure 2. The reactance curve (which we used to describe the low pass filter operation) shows that capacitive reactance varies inversely with operating frequency. With this in mind, look at the equivalent circuit shown in Figure 2b. As you can see, the near infinite reactance of the capacitor when the input frequency is 0Hz is represented as a break in the signal path. Therefore, the source is isolated from the load, and VRL = 0V. Assuming that the input frequency is near the high end of the reactance curve, XC can be assumed to be approximately 0Ω. With this in mind, look at the equivalent circuit as shown in Figure 2c. In this case, the low reactance capacitor is represented by a direct connection between the source and the load. As a result, the load voltage is approximately equal to the source voltage. Between the extremes represented in Figure 2, lies a range of frequencies over which VRL decreases from VRL≅E to VRL = 0V. We can use this relationship because only the component positions within the filter have changed. In other words, the relationship among fC, R, and C doesn’t change simply because the component positions have changed. Example 1 demonstrates the process used to calculate the cutoff frequency for an RC High-Pass filter. Calculate the cutoff frequency for the RC High-Pass filter in Figure 2a. 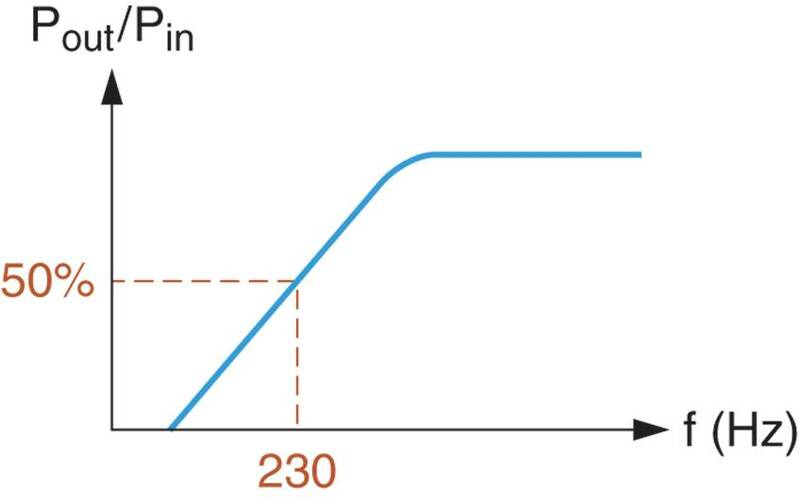 This result indicates that the power gain of the circuit is reduced to 50 % of its maximum value when the operating frequency decreases to 230 Hz. The frequency response curve for the circuit is shown in Figure 2b. An RL circuit acts as a high pass filter when constructed as shown in Figure 3. In the circuit shown, the resistor is the series component and the inductor is the shunt component. The filtering action of the circuit in Figure 3 is a result of the inductors response to a decrease in operating frequency. This response is illustrated in Figure 4. As the reactance curve indicates, XL approaches infinity as frequency increases. If the input frequency decreases to 0Hz, the inductive reactance decreases to 0Ω. In this case, the equivalent circuit in Figure 4b applies. Ignoring the small amount of winding resistance in the coil, the shunt inductor is represented as a shorted path to ground. In this case, VRL = 0V. If the input frequency to the circuit increases, the reactance of the inductor increases until the component effectively acts as an open. If we assume that XL ≡ ∞Ω, the equivalent circuit in Figure 4c applies. As you can see, the inductor is represented as a break in the shunt component path. In this case, VRL = E –VRF. Between the extremes represented in Figure 4, lies a range of frequencies over which VRL decreases from E –VRF to 0V. Where REQ = RF || RL. Example 2 demonstrates the process used to calculate the cutoff frequency for an RL High-Pass filter. Calculate the cutoff frequency for the RL High-Pass filter in Figure 4a. This result indicates that the power gain of the circuit is reduced to 50 % of its maximum value when the operating frequency decreases to 305 Hz. The frequency response curve for the circuit is shown in Figure 4b. As you can see, the analysis of an RL high pass circuit is identical to that of an RL low pass filter.